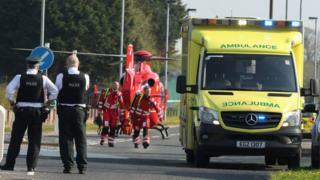 A young boy has been airlifted to hospital following a road traffic collision in County Londonderry. Emergency services, including the air ambulance, were called to the Edenmore Road area of Limavady at about 15:50 BST on Monday. Police said the young boy was riding a bike at the time of the crash with another vehicle. The driver of the vehicle was spoken to at the scene, police said. "Enquiries are ongoing and anyone who witnessed the collision or who has dashcam footage is asked to contact police in Limavady," a PSNI spokesman said.